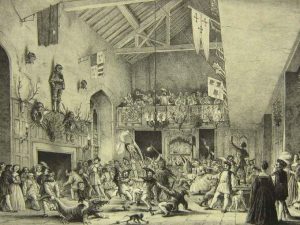 This article, written by founder and former producer Mary Swope twenty-one years ago for the then-print newsletter Revelations, shows how some aspects of Revels are timeless. 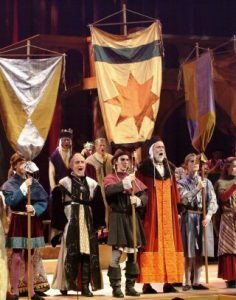 As preparations for our 2018 Christmas Revels continue, we all appreciate seeing the overlap — Piffaro: The Renaissance Band and Mark Jaster are back as guest artists, and talented Revelers like Roberta Gasbarre and Mary Gene Myer still contribute their endless spirit and energy to this Revels, but we all also enjoy knowing how fully different the result will be than it was in 1997. How different? You’ll have to wait and see! 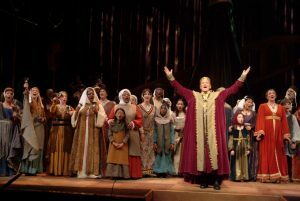 For a 15th season, Washington Revels brings to Lisner Auditorium the ancient and joyous celebration of the year’s rebirth that surrounds the winter solstice. We return to the great Banqueting Hall of a medieval castle in England with a king, his court and the versatile and entertaining musicians of Piffaro: The Renaissance Band. The evocative interpretation of the medieval Feast of Fools celebrates the Fool’s traditional association with the cycle of death and rebirth that lies at the heart of the Revels solstice festivities. At this dark season of the year, humanity counters natural and supernatural forces by turning to humor and an inversion of the everyday order of life. Roberta Gasbarre will direct the cast, and Judith Harrison is back as Music Director. Washington Revels is again fortunate to have the service of set and lighting designer Michael Philippi, who, with Miriam Hack, has designed the dramatic setting in which the story unfolds. The company will be gowned and wimpled, doubleted and hosed by the talented costume team headed by designer Rosemary Pardee and associate designer Emilie Long. Stage props created by Mary Eugenia Myer’s group will further evoke the magic of the solstice season. 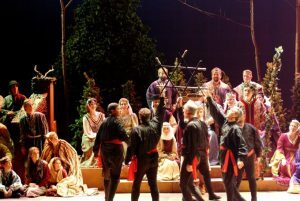 The production interweaves the tale of the King and his Fool with song, dance, and a rich variety of instrumental music. From Piffaro: the Renaissance Band, come the dulcet tones of a recorder and lute, the squeal of medieval bagpipes, and the blare of a shawm and sackbut. From the musicians of The Solstice Brass, once again led by Robert Posten, sound forth trumpet fanfares and robust accompaniment to processional and carols. Belled and masked, the Foggy Bottom Morris Men appear in several guises, in wonderful wild dances with sticks and kerchiefs as well as the ritual sword dance during the traditional mummers play Saint George and the Dragon. An auditioned chorus — The Haddon Hall Wassailers and Playford Dancers — will sing, dance and lead the audience in rounds, wassail songs and the ever-popular Twelve Days of Christmas. Visit our 2018 Christmas Revels website to see what’s similar — and what’s changed!